This blog entry about the events of Friday, January 06, 2012 was originally posted on January 13, 2012. “Hello,” greeted a Rwandan teen when I went for a solitary walk on the road to kill time just outside the guesthouse. I politely greeted him back and the entourage he was with, about five others. “I am Peter,” he said. “I am Jack,” said another. All of them took a liking to me, the foreigner, and I’m sure I wasn’t the first. They were fairly polite though — questionably genuine in their curiosity of me — and I didn’t mind them hanging around me for the getting-to-know you chit chat as I took some photos. “Do you like football?” Peter asked me. I knew he was talking about soccer. “Yeah,” I replied, which spawned a conversation about soccer. The group of teens were on a soccer team, which played at the school. They saw that I was taking pictures of the landscape and wanted me to take a picture of their team to send them via email. “You can send me on the email,” Peter told me, writing his address in my notepad. He explained how he and his friends were really working on their football/soccer skills so that they could win and eventually get a scholarship to the government school after senior school. “[We want to win, but we don’t have a ball to practice with,]” Peter told me, implying that I’d be doing them a huge favor if I had just gotten them a football at the store just 20 minutes up the road. “Eh, I don’t know,” I told them, which spawned a series of excuses not to help them out. Call me cynical or cautious, but I’d been in guilt tripping scams before. “I just came here to take pictures.” The group of humble teen boys wouldn’t let go of the ball idea and I kept making excuses. Luckily, I noticed a minivan pull into the parking of the Kinigi Guesthouse. “You will be back?” Peter asked. “Yeah,” I said without thinking. I walked down the path and saw that in the minivan was no one I could really meet; it was filled with guests of a wedding that was going to take place on the back grounds of the main house. However, I did notice that other travelers had arrived in the bar/common area, where I ordered a Coke and an onion soup that took about 30 minutes to prepare. I made small talk with an old American (from Park Slope, Brooklyn, NY), two Swiss and German women, and a Spanish couple arguing with the manager over a deposit — all of which seemed to be consumed with something. Then a lone young woman sat at a table nearby, reading Winter Garden, while waiting for a coffee. I noticed that she was waiting patiently while others who had ordered half an hour before her were just getting their food. “It’ll take you twenty minutes for you to get that coffee,” was my icebreaker. She was Kristin, an American Peace Corps volunteer in a border town in Uganda, who was in Rwanda just for the weekend — to see gorillas, obviously. We made small talk while she waited for two other Peace Corps friends to arrive. “Sure,” she said without hesitation, finishing her coffee. I went to put away my things in my room and when I regrouped with her, she was with two others — her Peace Corps friends I assumed — but they were new faces: Sarah, a former Peace Corps volunteer now living in Rwanda to work at Indego Africa (a liaison between local women artisans and big international distributors), and her visiting friend Joe, yet another guy from Park Slope, Brooklyn, NY. The two of them had arranged for a car and driver back in town and were looking for people to split costs, so I jumped at the opportunity. The two new guests settled in while Kristin and I head out to the countryside. “Okay, so there are going to be some guys who want me to buy them a football for them and I told them I went back here to meet my friend, so play along,” I told her. The boys were scattered around, but noticed when I was walking with new friend Kristin. She had some experience in the basic Bantu vocabulary (of which Lugandan and Kinyarwandan are derived) and was able to converse with them, as we walked up the road towards their village, Gahese. “Wiriwe,” she’d greet teens and adults. “Bite,” she’d informally greet little kids. Most children were excited that mzungus (foreigners) were wandering their town. Kristin and I went on a casual stroll that afternoon, as the boys gave us a tour of the area, showing us a woman weaving baskets, the fields of crops, and the church where they’d have to spend all of the next day (Jan. 8) for Epiphany services — they were Catholic. We walked down the dirt path and through a field of kids, I saw that the younger kids do play football/soccer (picture above) — only it’s true that they don’t have a real ball to play with; they kick around this wad of plastic shreds, bunched up and tied together with string. However, the game stopped when they saw I was shooting a video, which prompted them to dance and jump around for me. The boys continued their tour, looping back the way we came on a different road, beyond the little lambs, and the children following us. I was glad to have some American company with me. Eventually we came back to the area where the little shack (literally a shack) that sold goods — including a proper soccer ball — was located. “The football is there,” Chris said, pointing towards a little building. I figured the boys seemed decent enough, what the hell. I could at least check it out. Inside the rundown store, which was no bigger than a Western bathroom, there were shelves of random goods, including two soccer balls. Chris asked the woman at the table if he could see it, and he showed it to me. I had only been in the country for twelve hours and hadn’t be accustomed to exchange rates. I went outside to Kristin who was with some of the younger kids. “[That’s about thirty bucks,]” she told me. “I don’t think so,” Kristin replied. Thoughts rushed through my head to formulate a decision: Eh, what’s thirty bucks in the long run? I’ve given fifty bucks on occasion to charities like the Red Cross, and sometimes that money isn’t even given directly to those in need; it just banks the organization and sometimes just goes towards administrative costs or the stipends of volunteers. At least here, I know where the money is specifically going towards, and it’s not like they asked for money directly where they could have used it for other things — they just wanted a ball to play soccer to try and get a scholarship. 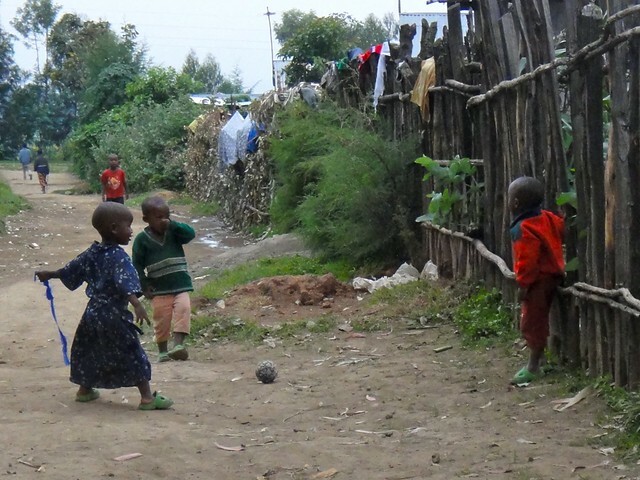 And in many countries, soccer is a means out of poverty. Thoughts like that were in my head — that plus the Catholic guilt. “I’m going to get these guys a soccer ball,” I announced to Kristin. I paid the woman in the store and she gave Chris the ball. “Thank you,” he said to me sincerely. The ball was a little flat, so he went home to get an air pump. “Thank you,” Peter said, which also sounded genuine. Peter urged me to come with them to play with it and shoot another picture of their team so that I could email it to him. Afterwards, we kicked the ball around in the field by the Virungas as the sun began to set — the boys were pretty good, and I hoped that I’d done them a kindness. Eventually it got too dark to play, and we parted ways. “So you’ll practice everyday?” I asked Peter. A GROUP OF FIVE AMERICANS soon replaced the five Rwandan boys when I went back to the guesthouse bar/common area. “We defaulted you to our car,” Joe the fellow Brooklynite told me, confirming my ride into the national park the following morning. Joining us was Mark and Kevin, Kristin’s Peace Corps friends from Uganda, who had finally arrived. There was plenty of time for the six of us to bond since the food (chicken curry) took so long to prepare. We had hoped that maybe we could crash the wedding that was in progress, but it ended rather abruptly — plus, according to Kevin, most modern Christian Bantu weddings aren’t exciting at all; they’re full of long, drawn out speeches that make you wish you weren’t invited. We sat around and shared our stories, but not for long; we had to be up in time for the 6:15 breakfast the next day — a day when there would be gorillas in our midst. When wandering the guesthouse before meeting Kristen, I noticed an older gentleman with a squinty eye, sporting a white beard like Hemingway, wearing a “9/11 Never Forget” t-shirt. “Are you from New York?” I asked him. “Even South Sudan?” I asked to confirm he’d been to the world’s newest nation. For fifty years, Al had traveled around the globe in intervals, spending more than a couple of rushed days in a place like some “country counting” travel friends I know. He only had Rwanda, neighboring Burundi, and Angola left. “It’s hard to get a Visa into Angola,” he told me. He left me to go for a walk, but not without giving me his copy of The Constant Gardener, which he had just finished. Up next: Damn Dirty Apes! you mean this guy Al has been to Djbouti? damn that chicken curry looks good!